I’m originally from Modesto, California. My heritage is Native American/Irish. When I was a kid I’d spend parts of my summers with family in the Southern California desert, and parts of it on a reservation. We would ride the horses and help out with chores, learning crafts, sewing, wood working, outdoors, survival, navigation, etc… I remember one summer we took a trip into the Santa Barbara Mountains. It was suppose to be a day hike but the adults got lost trying to take a group of us kids into the mountains to see a cave with Native writing, from hundreds of years ago, on the walls. We never found the cave, and we lost the trail. We ended up sleeping on a big rock while waiting for sunrise so we could set out to find our trail back out of the mountains. Panic set in for a few of the kids, but some of us stayed calm. After half a day of walking we managed to find the cow trail that led us out of the mountains and down to our original trail. I later found out [the whole experience] was a test of skill. I had passed the test because I did not panic or let my fear override and cloud my judgment. I was only 10. During my teen years, I did a lot of research into the paranormal and played around with Wicca. I decided that, with the energy that was inside of me, I best not mess with portals and things that “conjure”. I research the topics but don’t practice them anymore. The same goes for Wicca now. I moved to Maine in June 2008. It was the best decision I ever made. My life is so different now. I am thankful for everything in my life and all the people I have around me. I feel like I am finally the person I was suppose to be this whole time. With the ever changing economy I decided to go back to school to further pursue a passion of mine; I hope to be done with my degree in a couple of years. I currently work as an Administrative Assistant for a small company in Portland. Research and photography are two of my favorite hobbies, besides ghost hunting, so when I’m not doing either of those you can find me doing something that has to do with the paranormal. I quickly found that Ghost hunting was a much-needed outlet from schoolwork and a great way to get to know New England, being that I’m not from here. I decided to get involved with a ghost-hunting group, so I started to do research in Maine on the different teams. 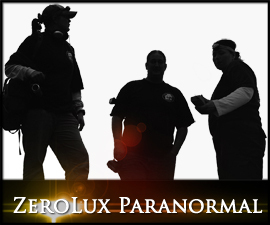 During a web search, I came across several websites and there was one that really caught my eye, Maine Ghost Hunters. I was 3 years old. My dad, my mom and I were driving through the desert, hauling bees across the state to relocate them for my grandfather. We came upon a bright light ahead in the road and our truck stopped and wouldn’t go any further. I remember the lights got closer, until right on top of us, and then suddenly they weren’t there anymore. They were off in the distance, in the sky, and our truck suddenly worked again. My dad told me that happened a lot during the times he hauled bees at night through the desert. At 9 years old, I was at my aunt and uncle’s house. I woke up one night because I felt cold. I looked up and saw a woman sitting at the end of my cousins bed. She was just sitting there looking off into the distance. I remember I tried to speak to wake up my cousin but I couldn’t get my voice out, and I couldn’t move either. So, I just laid there, and eventually she got up and almost floated into the hallway, and disappeared into the bathroom wall. In my adult years I’ve had two separate spirit mediums at two different times tell me about one of my spirit guides. The first time I was told about my spirit guide was in 2005, by a woman that I worked with who was a natural spirit medium. Then, in the summer of 2010, I was in a bookstore and a woman told me almost the same exact thing.